Malagasy (/mæləˈɡæsi/; Malagasy pronunciation: [ˌmalaˈɡasʲ]) is an Austronesian language and the national language of Madagascar. Most people in Madagascar speak it as a first language as do some people of Malagasy descent elsewhere. The Malagasy language is the westernmost member of the Malayo-Polynesian branch of the Austronesian language family. Its distinctiveness from nearby African languages was already noted in 1708 by the Dutch scholar Adriaan Reland. It is related to the Malayo-Polynesian languages of Indonesia, Malaysia, and the Philippines, and specifically to the East Barito languages spoken in Borneo (e.g. Ma'anyan), with apparent influence from early Old Malay. There appears to be a Bantu influence or substratum in Malagasy phonotactics (Dahl 1988). Malagasy is the demonym of Madagascar from which it is taken to refer to the people of Madagascar in addition to their language. Madagascar was first settled by Austronesian peoples from Maritime Southeast Asia from Borneo. The migrations continued along the first millennium, as confirmed by linguistic researchers who showed the close relationship between the Malagasy language and Old Malay and Old Javanese languages of this period. Far later, c. 1000, the original Austronesian settlers mixed with Bantus and Arabs, amongst others. There is evidence that the predecessors of the Malagasy dialects first arrived in the southern stretch of the east coast of Madagascar. Malagasy is the principal language spoken on the island of Madagascar. It is also spoken by Malagasy communities on neighboring Indian Ocean islands such as Réunion and Comoros. Large expatriate Malagasy communities speaking the language also exist in France and Quebec and, to a lesser extent, Belgium and Washington, DC. There are two principal dialects of Malagasy; Eastern (including Merina) and Western (including Sakalava), with the isogloss running down the spine of the island, the south being western, and the central plateau and much of the north (apart from the very tip) being eastern. Ethnologue encodes 12 varieties of Malagasy as distinct languages. They have about a 70% (~2000 years) similarity in lexicon with the Merina dialect. Southern Betsimisaraka Malagasy (2,000,000 speakers) – spoken by the Betsimisaraka in the North of the region Vatovavy Fito Vinany. Tesaka Malagasy (1,130,000 speakers) – spoken by the Antaisaka people in the southeast of the island. Tsimihety Malagasy (1,615,000 speakers) – spoken by the Tsimihety people. Additionally, Bushi (41,700 speakers) is spoken on the French overseas territory of Mayotte, which is part of the Comoro island chain situated northwest of Magadascar. The current Malagasy alphabet consists of 21 letters: a, b, d, e, f, g, h, i, j, k, l, m, n, o, p, r, s, t, v, y, z. The orthography maps rather straightforwardly to the phonemic inventory. The letters i and y both represent the /i/ sound (y is used word-finally, and i elsewhere), while o is pronounced /u/. The affricates /ʈʂ/ and /ɖʐ/ are written tr and dr, respectively, while /ts/ and /dz/ are written ts and j. The letter h is often silent. All other letters have essentially their IPA values. The letters c, q, u, w and x are all not used in native Malagasy words. After a stressed syllable, as at the end of most words and in the final two syllables of some, /a, u, i/ are reduced to [ə, ʷ, ʲ]. (/i/ is spelled ⟨y⟩ in such cases, though in monosyllabic words like ny and vy, ⟨y⟩ is pronounced as a full [i].) Final /a/, and sometimes final syllables, are devoiced at the end of an utterance. /e/ and /o/ are never reduced or devoiced. The large amounts of reduction vowels and their effect on neighbouring consonants give Malagasy a phonological quality not unlike that of Portuguese. all mean "I wash my hands with soap" though focus is determined in each case by the sentence initial verb form and the sentence final (noun) argument: manasa "wash" and aho "I" in (1), sasako "wash" and ny tanako "my hands" in (2), anasako "wash" and ny savony "soap" in (3). There is no equivalent to the English preposition with in (3). Malagasy shares much of its basic vocabulary with the Ma'anyan language, a language from the region of the Barito River in southern Borneo. The Malagasy language also includes some borrowings from Arabic and Bantu languages (especially the Sabaki branch, from which most notably Swahili derives), and more recently from French and English. ^ Hammarström, Harald; Forkel, Robert; Haspelmath, Martin, eds. (2017). "Malagasic". Glottolog 3.0. Jena, Germany: Max Planck Institute for the Science of Human History. ^ Adelaar, K. Alexander; Himmelmann, Nikolaus (2005). The Austronesian Languages of Asia and Madagascar. Psychology Press. ISBN 978-0-7007-1286-1. ^ Simon, Pierre R. (2006). Fitenin-drazana. L'Harmattan. ISBN 978-2-296-01108-3. ^ Serva, Maurizio; Petroni, Filippo; Volchenkov, Dima; Wichmann, Søren. "Malagasy Dialects and the Peopling of Madagascar". arXiv:1102.2180. ^ a b "Madagascar". Ethnologue. Retrieved 2017-06-17. ^ "Bushi". Ethnologue. Retrieved 2017-06-23. ^ Ferrand, Gabriel (1908). "Un vocabulaire malgache-hollandais." Bijdragen tot de taal-, land- en volkenkunde van Nederlandsch Indië 61.673-677. The manuscript is now in the Arabico-Malagasy collection of the Bibliothèque nationale de France. ^ Flacourt, Étienne de (1657). Le Petit Catéchisme madécasse-français.Paris;(1661). Histoire de la grande isle Madagascar.Paris, pp.197–202. ^ Flacourt, Étienne de (1658). 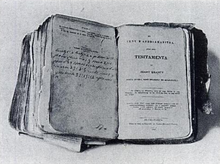 Dictionnaire de la langue de Madagascar. Paris. ^ Berthier, H.J. (1934). De l'usage de l'arabico=malgache en Imérina au début du XIXe siècle: Le cahier d'écriture de Radama Ier. Tananarive. ^ Ladefoged, Peter; Maddieson, Ian (1996). The Sounds of the World's Languages. Oxford: Blackwell. p. 131. ISBN 0-631-19814-8. ^ a b  Winterton, Matthew et al. (2011). Malagasy–English, English–Malagasy Dictionary / Diksionera Malagasy–Anglisy, Anglisy–Malagasy. Lulu Press. ^ Rasoloson, Janie (2001). Malagasy–English / English–Malagasy: Dictionary and Phrasebook. Hippocrene Books. Hurles, Matthew E.; et al. (2005). "The Dual Origin of the Malagasy in Island Southeast Asia and East Africa: Evidence from Maternal and Paternal Lineages". American Journal of Human Genetics. 76: 894–901. doi:10.1086/430051. This page was last edited on 14 March 2019, at 13:06 (UTC).